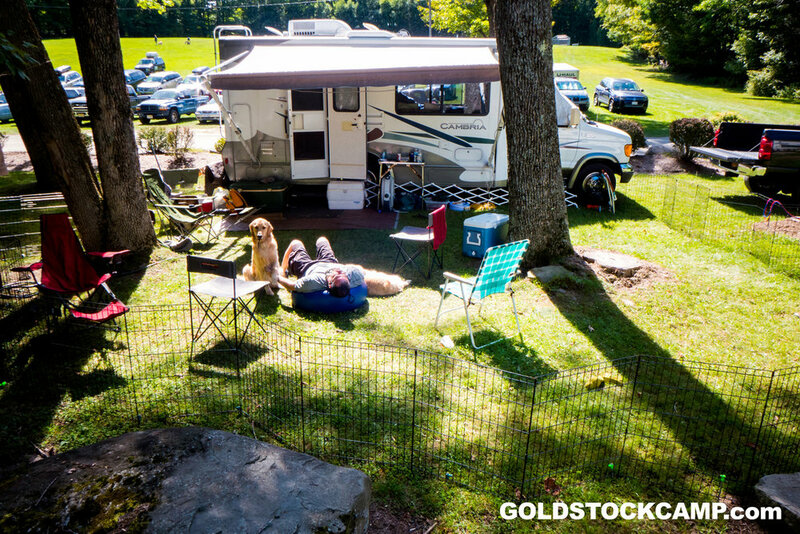 Goldstock offers unique opportunities for “camping” at a private campground with your choice of rooming with groups of like minded, dog crazy people in the camp cabins, pitching your own tent “up on the hill” or with your personal or rented RV. If you choose to RV at Goldstock, keep in mind that Camp Weequahic is primarily a children’s summer camp, and the camp does not have RV facilities. Our hosts have allowed RV’ers almost since the beginning of Goldstock 20 years ago, but we are pretty much on our own. Keep an open mind and be flexible and your RV experience will be like no other. Like the rest of Camp Goldstock, the RV workers are volunteers and do their best to assist. There are no assigned sites for RV’s. But, it has been customary that prior year RV’ers retained the space they were in previously. But, due to limited maneuverability through the campground, some areas are a first come, first served. There are 5 general areas where RV’s can set up. In the grass parking field across the street from camp. Wide open, but only a short area before the hill. The campground is in a hilly area of Northeast PA and the camp is hilly as well. Most RV’s will need some form of leveling, whether it is 2x8 boards, the plastic stacking blocks or the fancy hydraulic levelers. As an RV’er you will be expected to bring your own materials for leveling. There is no guarantee that there will be any lumber around camp for your use. So far we have been able to accommodate everything from the smallest pop-ups to 40’ 5th wheels. You can expect about 10-15 amps of power. Enough for your lights and battery chargers and maybe some fans. There is not enough power to run AC units. Electric service is minimal. Lot 3 - the campground has disposed of the panel that we had used previously (attached to the building). Electric last year was available by using extension cords into the building. Again you will be limited to about 15 amps of power - bring your long, heavy duty cords. Lot 5 will require solar power, onboard generators or quiet standalone generators (Honda type). As the panels are remote and limited to 1 per area, you will need proper extension cords. We suggest at a minimum you bring 100’ of 12 gauge extension cords, or bigger. You may only need 25’, the odds are really good you will need at least 50’ and 100’ is not that unusual. The Lot 1 panel location was changed for Goldstock 2017. The panel will be located in the same area it was for 2017, at the stockade fence. If you did not RV in 2017 in Lots 1 & 2, you will need a bit more cord to reach the panel. The panel is approximately 25-30 feet further away then what you were accustomed to. The Lot 1 panel is a 30 amp plug style only, so you will need the appropriate adapters. They are 30 amp RV receptacles, but they are on 15 amp breakers. You will still be limited to 10-15 amps. Although not likely, but if you get to camp before Duane and Debbie from New Jersey or Pam and Keith from Delaware, you will not have electric available to you. You will not be able to have a “water hookup”. We suggest you bring full freshwater tanks with you unless you are willing to do a little work to get water. There are three locations for water. Lots 1 & 2 have access to a water spigot near the end of the porch at the main dining hall. You will need a 75’ – 200’ of hose to use this spigot. We typically share hoses as few people can carry that much hose. Lot 3 has a water spigot located near the center of the cabin on the outside wall. 50’-100’ of hose is typical. Lot 4 has a water spigot along the right side of the main rally hall (registration building). You will need 75’-100’ of hose. There is no dump station or sewer facilities at this camp. There are commercial campgrounds in the surrounding areas and the closest one is the Honesdale KOA, about 14 miles south of camp. If you do not want to use your holding tanks, there are bathrooms in the main buildings as well as showers.